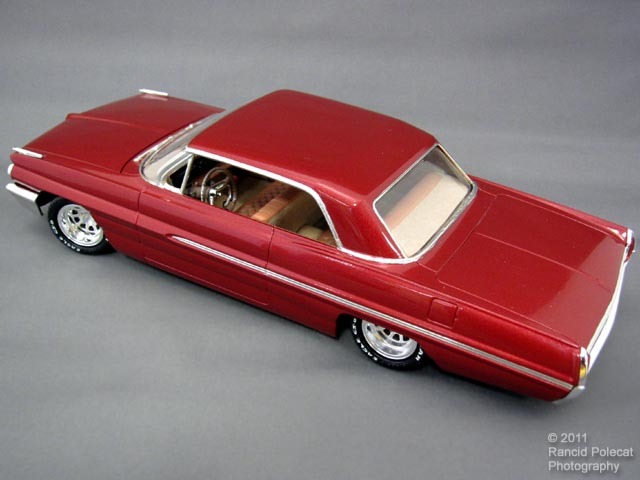 With exception of wheels and tires from his parts box, Bill assembled his AMT 1962 Pontiac Catalina Street Customs Edition kit pretty much straight from the box. He used Tester's One Coat Mythical Maroon Lacquer paint for the body. This color yeilds a striking contrast when coupled with the chrome parts, trim covered in Bare Metal Foil, the stark black of the white-lettered tires, and the complementary interior colors.